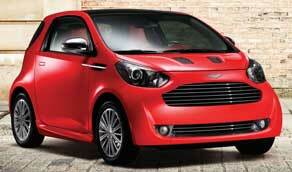 Aston Martin Cygnet (2011-2013) - Car Reliability Index | Reliability Index | How reliable is your car? With so few Cygnets around it's very hard to pinpoint any patterns of problems, other than those that apply to the Toyota IQ, so it's worth checking that guide also. The paintwork was applied by Aston Martin to a very high standard, so decent scrape or crash repairs are very costly to undertake. Predictably, the Aston shares the same interior traits as the IQ, which means it's all cleverly packaged but it's no four-seater, even though it was billed as such. There's no adjustment for the driver's seat and the steering wheel adjusts for rake only, so getting comfy might not be easy. Cars with a manual gearbox are much nicer to drive than those with the CVT, but it's the latter that's the most common. Cygnets are urban creatures which means they have to contend with lots of speed humps and kerbs. So check the tracking and look for damaged suspension. An optional extra was a five-piece luggage set. If you can find a car with one of these it'll be the ultimate collector's accessory.